Slime capsules composed of polysaccharides or glycoproteins coat the cell walls of some bacterial and algal cells. Passage of substances may require expenditure of energy (active transport) or may be passive (diffusion). Chromatin: Nudcoprotcin component of chromosomes (seen clearly only during nuclear division when the chromatin is highly condensed); only the DNA component is hereditary material. from light microscope during cellular replication. Nucleoplasm: Nonchromatin components of the nucleus containing materials for building DNA and messenger RNA (mRNA molecules serve as intermediates between nucleus and cytoplasm). Executes the genetic instructions from the nucleus. Internal membrane system (designated ER); rough endoplasmic reticulum (RER) is studded with ribosomes and modifies polypeptide chains into mature proteins (e.g., by glycosylation): smooth endoplasmic reticulum (SER) is free of ribosomes and is the site of lipid synthesis. 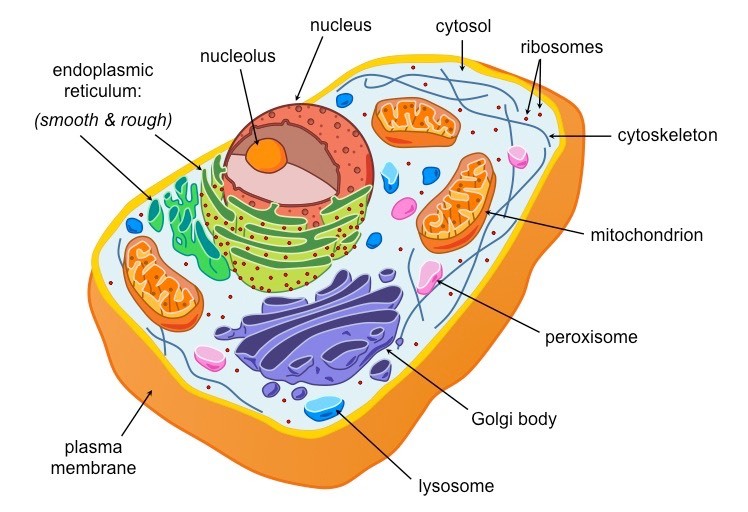 The fluid portion of the cytoplasm exclusive of the formed elements listed above; also called hyaloplasm; contains water, minerals, ions, sugars, amino acids, and other nutrients for building macromolecular biopolymers (nucleic acids, proteins, Lipids. and large carbohydrates such as starch and cellulose).